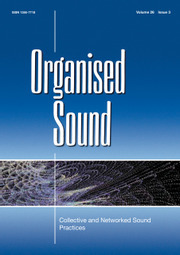 Organised Sound is an international peer-reviewed journal which focuses on the rapidly developing methods and issues arising from the use of technology in music today. It concentrates upon the impact which the application of technology is having upon music in a variety of genres, including multimedia, performance art, sound sculpture and music ranging from popular idioms to experimental electroacoustic composition. It provides a unique forum for anyone interested in electroacoustic music studies, its creation and related developments to share the results of their research as they affect musical issues.